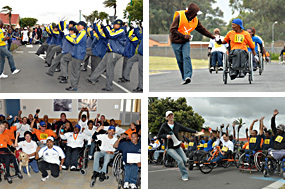 The first ever Mitchell's Plain Wheelchair Race took place at the WCRC on 7 November 2009. The race was organised by the Western Cape Rehabilitation Centre Facility Board and the QuadPara Association of the Western Cape, and with the assistance of the Maties-Helderberg Sports Club for Persons with Physical Disabilities and the WP Cycling Association PD. With 180 entrants (including 9 corporates) taking part in the event, the day proved to be such a tremendous success that many requested this to become an annual event. The very strong north westerly wind failed to dampen spirits and the WCRC site was buzzing with activity. Races were held in various categories which catered for wheelchair users with varying levels of fitness. The serious athletes, whom included many from the Maties-Helderburg club, braved the 21 km course in their hand cycles, while approximately 40 wheelchair users tackled the 6 km track. The majority of participants took part in the 800 m race, where races were competitive but the emphasis was on having fun (See list of winners). Each participant received a goodie bag manufactured from Levy denim, which thanks to the sponsorship of various companies, were filled with all sorts of items, such as energy bars, caps, T-shirts, magazines, juices and cookies. There were various lucky draws, which meant that even if you came last in your race, you still had the chance of going home with a prize. The grounds and corridors of the WCRC were a hive of activity with various demonstrations including wheelchair rugby, basketball, karate and ballroom dancing taking place. There were various stands displaying the latest in assistive devices as well as the services that they offer to people living with disabilities. A number of crafters came along to sell their products and there was a variety of food stalls selling their delicious goodies which were just too good to resist. The Marching Squad from Portlands High School wowed the spectators with their procession marching, while DJ, Dean Bernickow, displayed his musical talent and ensured that there was a lively beat throughout the day. Our master of ceremonies, Benito Vergitone of KFM fame, kept everyone informed and entertained. We were privileged to have Mr Nando Bhula, General Manager of Eskom Peaking Generation participate in the prize giving ceremony. This day would not have been possible without the involvement and sponsorship of various companies who were prepared to support a brand-new event. Organisations and Companies, such as The Chris Burger Petro Jackson Player’s Fund, Equity Loss Adjustors’ in Gauteng, Eiger Equipment, Liberty Promenade Shopping Centre in Mitchell’s Plain and the Spur Group in Cape Town dug deep into their pockets to award prizes to the winners of the various races. We are extremely grateful to each and every sponsor for the role that they played in making this day a memorable one for wheelchair users in our community. (See list at bottom of page for the names of those who all contributed). A large number of volunteers gave up their Saturday to ensure that this day was the success and to them to we are extremely grateful. A special thank you to Eskom Peaking Generation who not only financially sponsored various items, inclusive of the medals for the event, but also rolled up their sleeves and put their own blood and sweat into the event by marshalling and assisting with various aspects on the day. The enthusiasm of their team was infectious and set the tone for the day and showed all of us that Eskom Peaking Generation genuinely do care about people with physical disabilities. This event exposed wheelchair users to various wheelchair sports as well as other activities and gave serious athletes the opportunity to exhibit their skills and compete in their favourite sport. 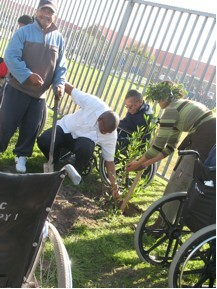 In addition to this the day served as an opportunity for wheelchair users to make new friends and renew old friendships. There was a wonderful camaraderie and a sense of belonging and I know that the wheelchair users enjoyed having a day where they could forget about their disability and focus, showcase and celebrate their ability. Click here : to view photos of the event. During 2009, our clients have had the wonderful opportunity to attend wheelchair ballroom dancing classes here at WCRC. The instructor, Gladys Bullock, encourages and inspires all clients to participate and learn. And to just have fun! But apart from having fun, the physical benefits of the activity are obvious. Wheelchair Ballroom Dancing requires core stability, wheelchair dexterity, co-ordination, balance, and the list continues. From a cognitive point of view, the client needs to be able to plan and remember the sequences. For some clients this is not easy, but because the setting is so relaxed, as the session progresses, they find it easier to participate, and very often show a marked improvement by the end of the session. There is also the benefit with regard to social interaction. It is a fun time to interact with other patients and staff in a relaxed environment. It encourages team working, as the clients need to partner others for some of the dance sequences. The clients tend to encourage and support one another, particularly if they see them struggling. Six of our clients have also had the opportunity to participate in the Western Cape / Truworths Disabled Ballroom & Latin American Dance Trials. They danced the Waltz and the Jive, and were all placed in each category. But I think the most wonderful outcome of the sessions is the enjoyment, and emotional benefits. The smiles and laughter tell the story of how much the clients appreciate this opportunity. It is a time for them to participate in rehabilitation, but in a relaxed manner. We have heard many wonderful comments from the clients after participating the class, including requests that this could one day be extended to include out-patients. But the comment that really touched me, I have shared below. Most of us will probably remember the 9th of May 2009 as the Saturday that we had to get up at 4 am! 28 People (including 8 staff members and 20 WCRC clients) gathered at 5:30 am to leave for Hermanus to attend the annual Wheelchair and Runners Race. After we fitted everyone in and managed to stack 20 wheelchairs on one trailer, we were on our way. It turned out to be a beautiful day and a well attended event. The WCRC had participants in both the five and ten kilometres wheelchair race, 10 kilometres run and 5 kilometres fun walk. The route took us down the main road, along the seaside and into the suburbs. It was jammed packed with all participants sharing the same lane! After all participants completed the race, and were awarded with a whale shaped medal, the long wait for the prize giving started. We were on the brink of leaving when the winners of the 5 and 10 kilometre races were announced. It was a great surprise when the WCRC walked away with 5 prizes to the total value of R1550!! Congratulations to the following winners: Midas Maraqa (10 kilometres); Cyril Edon (10 kilometres); Yvonne Jacobs (5 kilometres); Noma-India Christabella Zenzile (5 kilometres) and Shaheed Salie (spot prize). Overjoyed by our win, we left for Paradise Park where we had a ‘lekker’ braai and spent a relaxing afternoon. It was a tired, but happy team who arrived back in Mitchells Plain at around 18h00. We would like to thank all our sponsors listed below for enabling us to participate in this inspiring event and look forward to host our very own race at the WCRC in the near future! 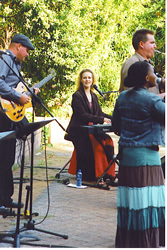 Approximately 300 persons (adults and children) gathered on Sunday, 29 March 2009 at Maynardville Open Air Theatre in support of Amanda Tiffin’s second Fundraising Concert in aid of the WCRC Health and Wellness Centre. Amongst them were many fans of Amanda Tiffin and Shannon Mowday, as well as a few non-jazz lovers, who only attended the concert in support of the WCRC, but are now converted Jazz lovers and fans of Shannon and Amanda. Amanda’s diverse and excellent programme included the musical talents of Sandile Gontsana, Lee Gelderbloem, Nicky Schrire, Cedric Vandenschrik saxophonist Shannon Mowday, her talented guitarist Jeremy, Double Bass player Seigo Matsunaga, visiting from Japan, and Amanda’s LittleBigBand. The highlight for many was definitely the stage appearance of Shannon Mowday, with her father Bob Mowday in an unexpected daughter and father duo performance. Given the current economic climate, it is heartening that performers of the calibre of Amanda Tiffin, Cedric Vandenschrik and Shannon Mowday found the time for this show, as well as to perform free of charge. There were many people with disabilities amongst the spectators. This event, venue and reasonable ticket prizes offered them the opportunity to fully participate in the day’s activities. The superb ambience of Maynardville Open Air Theatre, created by the surrounding trees in the Maynardville Park, the sunny weather and the sound of fine music, directed by Amanda Tiffin, all contributed to a jazz event that will definitely secure a place on the Cape Town Annual Events’ Calendar! After all, Amanda publicly announced her commitment to this annual event! “I thoroughly enjoyed Jazz at the Park and knowing that this was in aid of the Western Cape Regional Rehabilitation Centre made the music so much more enjoyable! Both Amanda and Shannon are amongst my favourite performers and it does not take much to get me to listen them at any time of day. Bob Mowday's surprise performance was so fabulous. It was the first time I had seen or heard of Lee Gelderblom (so talented! ),Cedric Vandenscrik Sandile Gontsana and Seigo Matsunanaga each of whom put on fantastic performances. Nicky Schrire also gets a big thumbs up from me! Ten out of ten to Amanda for hosting this great concert and to all the musicians for coming out in full support! I am looking forward to next year's concert already and will bring my friends with me"
eventually did end. What a treat to be entertained by so many different artists all with their own styles and strong points. It is difficult for me to single out one particular performance or artist as they were all superb. From my vantage point I was able to see the entire audience and it was great to see the various members of the audience enjoying the performance and "bopping" to the music. There was one gentleman in particular who smiled and danced his way through the entire show, the look of sheer enjoyment on his face will stay with me for a long time. Please visit our link for photos of the day. 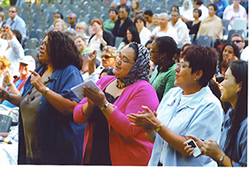 Read the article that was published in the Plainsman, a local community newspaper in Mitchell’s Plain on 25 February 2009. The WCRC Facility Board secured the services of Jacques Lloyd during October 2008. Jacques is an expert in the field of disability and Human Science Movement. He obtained a degree in Sports Science, as well as a Masters Degree in Adapted Physical Activity. He currently assesses those interested in working out in the gymnasium and develops an individualised training programme for them. Amandla Mbobosi, a 25 year old man from Khayelitsha was exposed to the gymnasium whilst an in-patient at WCRC. He showed such enthusiasm, that Jacques is currently training him as a gymnasium assistant. Fuzlin Sinclair, Liberty Promenade Operations Manager was instrumental in obtaining a donation of swimming equipment, as well as gift vouchers to a total value of R10 000.00 from the Centre Management. The swimming equipment (life jackets, goggles and swimming caps) enabled the WCRC Facility Board to launch their pool related activities. The services of two swimming coaches, Donna Fraenkel and Susan Simpson were obtained during January 2009 to commence these activities on Tuesdays, Wednesdays and Thursdays. Volunteer Home carers assist with getting clients on and off the hoist at the pool. Bookings via Teresa Weppenaar on 021 3702313. See our ‘How can you assist us’ regarding any donations such as life jackets, swimming gear, gym equipment, etc. 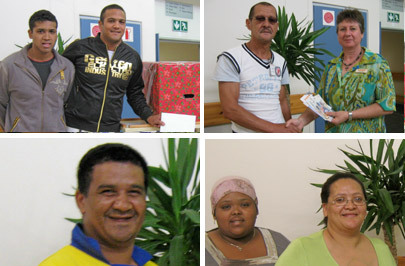 22 December 2008: WCRC announces the winners of the Christmas Fundraising Drive, sponsored by the Facility Board and the Management of Liberty Promenade Shopping Centre. 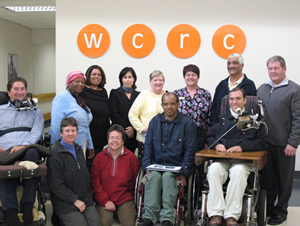 12 DECEMBER 2008: WCRC CONTRIBUTES TO THE WORLD HEALTH ORGANISATIONS� GUIDELINES ON THE PROVISION OF MANUAL WHEELCHAIRS IN LESS RESOURCED SETTINGS. A WCRC employee (Elsje Scheffler, Chief Physiotherapist) was one of two South Africans involved in establishing the WHO Guidelines and was also involved in the final document as a peer reviewer. Furthermore, South Africa, and specifically the WCRC, was listed as one of only six training centres in the world for the training of wheelchair related services. The WCRC is already recognised as an expert in this field and several African Nations have sent clinicians to the WCRC for training in this regard. WCRC held an information and awareness- raising session for officials from the Department of Health and various service providers, such as CE Mobility and Shonaquip on 12 December 2008. Elsje Scheffler and Jenny Hendry (HOI) informed the attendees about the different kinds of wheelchairs that are on tender, training aspects and the implications of the WHO Guidelines on Service Delivery. Guests had the opportunity to try out different wheelchairs on the WCRC obstacle course. Dr Beth Engelbrecht and Dr K Vallabhjee were some of the invited guests at this event (View our photos of the event). On 27 August 2008, in Quebec City, Canada, on the occasion of the 21st World Congress of Rehabilitation International, WHO, the US Agency for International Development, the International Society for Prosthetics and Orthotics and Disabled Peoples' International have launched an important new document: Guidelines on the provision of manual wheelchairs in less resourced settings. The wheelchair is one of the most commonly used assistive devices for enhancing the personal mobility of people with disabilities. An estimated 1% of the world's population, or just over 65 million people, need a wheelchair. In most developing countries, few of those who need wheelchairs have access, production facilities are insufficient and wheelchairs are often donated without the necessary related services. Providing wheelchairs that are appropriate, well-designed and fitted not only enhances mobility, but also opens up a world of education, work and social life for those in need of such support. The guidelines, developed for use in less resourced settings, address the design, production, supply and service delivery of manual wheelchairs, in particular for long-term wheelchair users. The guidelines and related recommendations are targeted at a range of audiences, including policy-makers; planners, managers, providers and users of wheelchair services; designers, purchasers, donors and adapters of wheelchairs; trainers of wheelchair provision programmes; representatives of disabled people's organizations; and individual users and their families. By developing an effective system of wheelchair provision, Member States support implementation of the Convention on the Rights of Persons with Disabilities and the May 2005 World Health Assembly resolution A58/23 Disability, including prevention, management and rehabilitation. Guidelines on the provision of manual wheelchairs in less resourced settings is freely downloadable here or can be obtained in hard copy via the online order form. For further information, please contact Mr Chapal Khasnabis at khasnabisc@who.int. 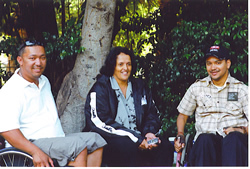 The enthusiasm and passion of Kirsti Browne, a qualified horticulturist , who contacted the WCRC during October 2007 after visiting a friend in Ward F, has led to the implementation of Deon Bronkorst’ landscaping plan for the WCRC. The WCRC Facility Board has managed, with her assistance and the sheer generosity of companies such as Cape Garden Centre, Stanler Farms, Habitat Nursery, Barney's Terraflora in Stellenbosch, Biocircle in Klapmuts, Michell's, Shadowlands, Doublegrow, Poleyard, Starke Ayers, Landscape Garden Company, and Eco-grow to host a successful Adopt a Tree event on 03 September 2008, as part of the National Arbor week. The donation of compost, potting soil, pots, 191 indigenous trees, 150 shrubs and various seedlings adds to the wonderful ambience of the institution. “Any person that suddenly becomes disabled will experience the WCRC as an oasis during their rehabilitation period”, said Mr Lugt who is the Chairperson of the Facility Board and a wheelchair user. “At the WCRC we see rehabilitation as a whole and in this process a pleasant, beautiful environment can make such a difference to one’s frame of mind. Having had a life changing experience like losing a limb(s) or being paralyzed and suddenly being in a wheelchair, can be like being thrown from a happy and fulfilled home into a parched and demanding desert. In a desert the place to find, is an oasis and that is what we would like the WCRC to be for those affected by these tragedies of life”. The Mpilisweni Consortium got the tree planting underway by assisting with the digging of holes beforehand and on Arbor Day staff, students, clients and Facility Board members all joined forces to plant shrubs and seedlings. The next phase will be to plant the trees. The roll out of the WCRC landscaping plan will add value to the greening of the Cape Flats area and is also an effort by the WCRC to aid in the fight against global warming. The WCRC hopes that this initiative will encourage the Mitchells Plain and surrounding communities to embark on other various greening activities within their own communities and surroundings. Ms Rosieda Shabodien called on all people of the Western Cape to join the staff of the WCRC and to show that each one of us can make a difference by supporting this kind of initiative. Prior to the event, Amanda Tiffin stated her reasons for her involvement, "I decided to help because I thought of the case of a friend of my family, who was very badly injured in a Car accident years ago. Her spine was badly damaged and she has never regained full use of her body, being confined to a wheel chair, and worse. WCRC does amazing rehabilitative work for people, and it is wonderful that it is available to people who may not ordinarily have access to expensive treatments. I especially wanted to help after seeing the centre, and how all the people who work there have tried to make it a positive and caring place - not a depressing one. Where people who have had lost so much could find a way to look forward." 312 Persons attended the event and the target of R30 000 was achieved. WCRC wishes to thank the Facility Board members and WCRC staff who drove the marketing process. We are extremely grateful to companies such as OCC, Lowe and Petersen, Feedem, Mpilisweni consortium, Chrysler Jeep Dodge Lifestyle Centre, Doves Bellville, Bravo Design, Motivation UK, Shonaquip, Cheshire homes, Chris Burger Petro Jackson Players' Fund and the Disability Desk for their support. Back Row (L- R): Anthony Ghillino (Chairperson QuadPara Association : Western Cape), Maria Uppie (from Mitchell’s Plain Health Forum & part of Steering Committee: Training and Capacity Building, Lucia Hess-April (Senior OT lecturer at Faculty of Health Science, UWC and Chair: WCRC Health and Wellness Centre Committee), Dr Helen Sammons ( Acting Head of Clinical services & representing all WCRC Clinical staff), Kath Green ( Representing Cape Women’s Agricultural Association and previously member of Conradie Benevolent Association- chair the Social Assistance Fund Committee (focuses on aspects such as toiletries, clothes, food parcels and outings for the patients), Jenny Hendry (HOI), Ivan Charles (Manager Turfhall Cheshire Homes, Vice Chair: Disability Network), Jim van Rooyen ( Head of Administrative Services). 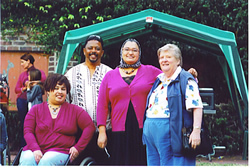 Front row (L-R): Alta Ferreira (Clinical Resource Development Officer & co-opted member), Jorietha Kloppers (Administrative Officer: Finance), Colin Williams (Manager Beaconvale Frail Care Center & Chair: Disability Forum, Mitchell’s Plain) and JP Lugt (Business expert & Chair: Marketing - and Facility Improvement Committees.